RBI 8900 Series atmospheric combustion units offer thermal efficiencies of 81% and are the most durable and serviceable boilers on the market. They offer a wide 420 to 1,900 MBH size range for applications from car washes to office buildings. All models come with intermittent pilot ignition, adjustable high limit, and 24V gas valve with either single-stage or two-stage firing. A motorized gas valve for modulation firing is also available. Ease of installation and service are trademarks of all RBI water heaters and boilers. Critical components are fully accessible, including slide out burner tray and heat exchanger to make short work of service and maintenance calls. Inspection and replacement of combustion chamber by simple removal of end panel and end refractory can be done in less than 15 minutes. All major components can be inspected or removed without disturbing boiler casing or breeching. 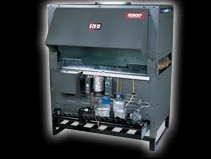 Please visit www.rbiwaterheaters.com/hot-water-heaters/8900.html for more information.